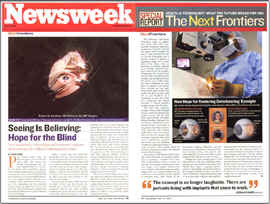 "Seeing is Believing-Hope for the Blind"
Read the Exciting Article in Newsweek featuring Dr. Kershner! Turn to the one person who can you trust for knowledge, experience, and results. Why do so many experts seek the opinion of Dr. Robert Kershner and Eye Laser Consulting? For the same reason they chose Dr. Kershner for surgery on their own eyes. With an unparalleled and exclusive resource of professionals, academic, community leaders, executives, administrators, researchers, and industry consultants, Eye Laser Consulting provides key decision-makers with the information they need to grow. Do they know something you don't?. 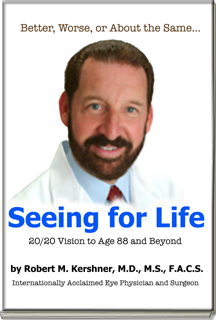 If you simply must have information and need it quickly, turn to the key ophthalmic resource , Dr. Robert M. Kershner. Dr. Kershner has personally helped tens of thousands of people see more clearly by providing the latest in vision correction technology. Let him shape yours. 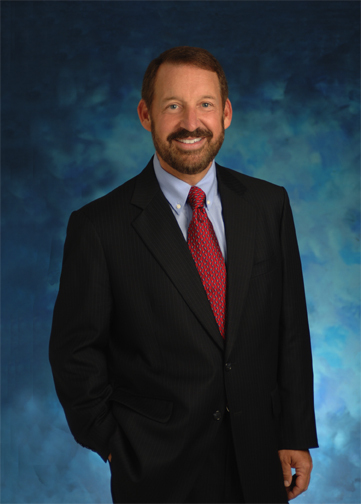 Dr. Kershner, is an internationally recognized authority on diseases and surgery of the eye. He serves as Clinical Professor of Ophthalmology, Professor and Chairman of Ophthalmic Medical Technology, and is the author of more than two hundred scientific articles and twenty-seven textbooks on eye microsurgery. Ophthalmologists and industry representatives worldwide, from the United States, to Canada, Austria, Brazil, France, Portugal, Italy, Norway, India, Mexico, China, Thailand, Japan, South Africa, Switzerland, Taiwan, Holland, Australia, Czech Republic and Russia have benefited from the knowledge and world class skills of Dr. Kershner. Listed in the "Guide to America's Top Ophthalmologists" published by the Consumers' Research Council of America in Washington, DC. and honored again and again by ophthalmic organizations the world over, Dr. Kershner is a known leader of excellence in the field. Dr. Kershner has personally performed more than twenty-eight thousand cataract, refractive and glaucoma procedures since 1981, and has practiced in Tucson, Arizona, Boston, Massachusetts and Southern Florida and has performed pioneering surgical procedures in many countries globally. A pioneer in the correction of astigmatism with cataract surgery, and a leading expert on visual neuroadaptation, people from around the world trust their eyes to Dr. Kershner. New Ophthalmic Breakthroughs are occurring every day. Are you on top of the rapidly changing field of eyecare? Do you or someone you know have cataracts? New flexible and injectable intraocular lenses have revolutionized the science of vision correction at cataract surgery. These new microscopic lenses, miniature miracles no bigger than the width of a pencil, can be permanently implanted inside the eye through a clear corneal microincision, an opening smaller than 2.0 millimeters. Because the implanted lens is flexible it can be placed without sutures, without injection anesthetics and without the need for bandaging the eye. The lens does not wear out or require replacement and once removed, the cataract cannot return. America's baby boomers are aging. With age comes poor vision due to cataracts. It all starts at the age of forty with the need for reading glasses, a condition known as presbyopia. Further clouding of the natural eye lens decreases the contrast of images and blurs vision. For the over 2.9 million Americans who undergo cataract surgery every year, there is hope. Innovative new implantable intraocular lenses (Premium IOLs), replace the aging eye's cataract and can improve vision better than ever before. A microscopic optical device about the size of the end of a pencil, the IOL is permanently implanted inside the eye in a brief, outpatient procedure. According to Robert M. Kershner, M.D., F.A.C.S. the author of a study published in the Journal of Cataract and Refractive Surgery, new aspheric toric and multifocal IOLs are a considerable advance over existing technology. These lenses can improve functional vision and the driving safety in patients in whom the lens is implanted. For more information on VISION AND DRIVING SAFETY refer to Dr. Kershner's article published in EyeWORLD magazine. An article in the August 21, 2002 issue of the Journal of the American Medical Association (JAMA), found that patients with cataracts who underwent cataract surgery and intraocular lens implantation had half the rate of automobile accidents during the follow-up period compared with cataract patients who did not undergo surgery. At the time of cataract surgery the proper implant can be selected to correct nearsightedness, farsightedness and astigmatism. See what people have said about having had their cataract surgery with Dr. Kershner. For many people, these microscopic miracles can improve vision for driving, watching TV, bowling, or playing golf without the continuous need for eyeglasses. Age is not a factor! Almost anyone can enjoy clear vision no matter what their age! Listen to what your friends are saying about their Cataract Procedure! EAT RIGHT AND SEE CLEARLY READ THE LATEST HERE! Change the Way You SEE, and Change Your LIFE! Refractive IntraOcular Lenses Offer Less Dependence on Eyeglasses-Can They Really Deliver as Promised? The FDA has approved several new Intraocular Lens Implants (IOLs) that specifically improve near and distance vision. Each of these IOLs are different but they all are designed to allow focus for both near and far. Following removal of the natural lens during cataract surgery, implantation with one of these lenses can improve the range of vision previously unobtainable with conventional monfocal lenses. These advanced technology IOLs can even correct astigmatism and improve contrast. New Retinal Therapies promise treatment for millions of people who have Age Related Macular Degeneration. A Host of New Injectable drugs can stop or slow the progression of visual loss that was inevitable in people with AMD. Interested in knowing more about LASIK Laser Vision Correction? Question: Why did more than 18 million Americans undergo Lasik Laser Vision Correction for nearsightedness, farsightedness or astigmatism? They have discovered the freedom of life without lenses. Are you afraid of Lasik? If so, listen to this! The Technology is better than ever before. If you've waited for the procedure to be "perfected", wait no longer. Most prescriptions can now be corrected with incredible accuracy to within 0.25 microns! Customized LASIK applications are making the precise correction better than ever before. LASIK is Quick. Typically, the actual laser application is less than thirty seconds, and both eyes are completed in 5 to 10 minutes. LASIK is Not Painful. There are no bandages, both eyes are corrected in one procedure, and one day off from work is all that most people require. LASIK Does NOT Wear Off. The laser procedure is permanent. LASIK is NOT Expensive. If you've waited for the price to decrease...wait no more! LASIK will never be more affordable than it is today! Whatever you enjoy, think of how much more you could enjoy every day, without the burden of eyeglasses and contacts*. The time to achieve visual freedom is now! Listen to what your friends are saying about LASIK! Even the doctor and members of his staff have had their eyes corrected! Watch a brief video on the procedure and listen to what people are saying about LASIK! Do Your Eyes Feel Scratchy? Are You Unable to Wear Your Contact Lenses for as Long as You Would Like? We have gained extensive experience helping people just like you, experience greater comfort and clearer vision. The treatment for dry eye is simpler than you might think. And once you know how to eliminate this common irritation, life can become a lot more comfortable! See what treatments are best for you. Robert M. Kershner, M.D., M.S.,F.A.C.S. is pleased to provide you with the latest information on advances in vision correction and the medical diagnosis and treatment of eye diseases. With more than twenty-five years of experience, tens of thousands have trusted Doctor Robert Kershner and Eye Laser Consulting. To learn more about Your Eyes, get a copy of Dr. Kershner's book, "Lessons From the Practice-The Gift of Sight"-A Guide to Understanding Your Eyes or view covered topics by clicking on the button onn the left hand menu "Your Eyes". To Learn More About Glaucoma, visit Consultation Corner by clicking here to enter. To Learn More About Your Eyes, Macular Degeneration and other common diseases enter Consultation Corner. Change the way you SEE...and change your LIFE! Robert M. Kershner, MD, FACS is one of the world's most experienced refractive eye specialists, a published educator, journalist, industry consultant, eye physician and surgeon. He has helped thousands of your friends and neighbors to see more clearly without dependence on eyeglasses and contact lenses and has innovated dozens of surgical procedures, new medical devices and instruments. Consult directly with the source, See Dr. Kershner for Answers to Your Questions. Eye Laser Consulting. Call or Contact us for more information! This website is intended for educational purposes only. It is not a substitute for medical advice from a physician. Use of this site constitutes an agreement between the user and Eye Laser Consulting and Robert M. Kershner, MD, MS, FACS which releases Eye Laser Consulting and Robert M. Kershner, MD, MS, FACS from any acts of omission or commision and any and all liability. Designed & Developed by Robert M. Kershner, M.D., M.S., F.A.C.S. Copyright © 1998-2009. All servicemarks, trademarks and copy herein are registered property of Robert M. Kershner, MD, MS, FACS. All rights reserved. EyeLaserConsulting™, Eye Laser Center™, "Seeing for Life™", EyeBionic™ "CN4Life", "C2FocusLens™", "CN2Focus™", and "CN4Near™" are registered service marks of Robert M. Kershner, M.D., M.S., F.A.C.S.